Once warm weather hits, it is hard to keep myself from grilling every meal and every course for each meal. It's not just the end result of grilling that I enjoy, but the act itself. From igniting the first flame, to seeing those beautiful grill marks, to enjoying the final, smoky result, I love it all. This grilled bread made a fantastic appetizer for a pasta dish we enjoyed a few weeks ago. This is incredibly simple, and very versatile as well - serve as a light lunch with a side salad, as part of an appetizer spread for a party, as a side with grilled meat or a pasta dish, or just on it's own as a snack. These grilled breads are also incredibly easy - just slice the bread, grill, rub with garlic, top with cheese and prosciutto, and return to the grill just long enough to melt the cheese. In my opinion, the most important step of this recipe is rubbing with garlic. I loved loved loved the garlicky bite that these had, and it truly took this dish from good to great. adapted from The Barefoot Contessa, How Easy is That? Prepare the grill to medium-high heat. Clean the grates and brush with oil. Brush each slice of bread with olive oil. Grill for 2 minutes, until golden on one side. Remove from grill and place grilled-side up on a platter. As soon as it's cool enough to handle, rub the grilled side with the cut garlic. The harder you rub, the more garlicky the bread will be. 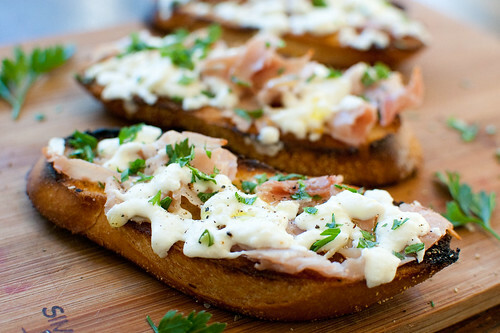 Place the torn prosciutto over the grilled side of the bread and top with the shredded mozzarella. Return to the grill, cover, and cook just until the cheese is melted, 1-2 minutes. Drizzle with additional olive oil and sprinkle with pepper and herbs. Serve. this looks amazing! I love all the components and I'm sure that grilling enhances all the flavors, YUM! This looks so lovely. Beautiful app. This is EXACTLY the kind of thing I want to have out for our first grill out (whenever we buy one...). I love all the flavors and bright colors. Thanks so much for sharing this great idea!